Because of its favorable location in the valleys of the Appalachian Mountains, various interstate freeways have now paralleled nearly the entire 1,645 miles of US-11. Unlike most other long-distance US-routes, it has not been shortened by these freeways. Only the section from Rouses Point to Watertown, New York has no freeway beside it. In particular, I-81 parallels the route from Watertown to Dandridge, Tennessee. After that point, various segments of I-40 and I-75 continue to run alongside US-11 south to Chattanooga, Tennessee, where I-59 takes up the journey to Slidell, Louisiana. After that, I-10 finishes the short hop into New Orleans. At the New Orleans end, US-11 used to cross the Pearl River on its own bridge until about 1966, when it was rerouted to cross on the new I-59 bridge. The old bridge was dismantled in the mid-1970s, so you cannot drive that part of the 1962 routing. The final segment from Slidell across Lake Pontchartrain was added to the system in 1937, when the State of Louisiana purchased the privately-owned Pontchartrain Bridge. Highway US-11 crosses both our US-6 and US-23 roadtrips. The route travels together with US-6 from Scranton, Pennsylvania to Factoryville, Pennsylvania. I’ll discuss the crossing of US-23 later in this article. One interesting feature of US-11 is the loop formed by a split into two routes. From Knoxville, Tennessee to Bristol, Tennessee, you have your choice of traveling either US-11E or US-11W. 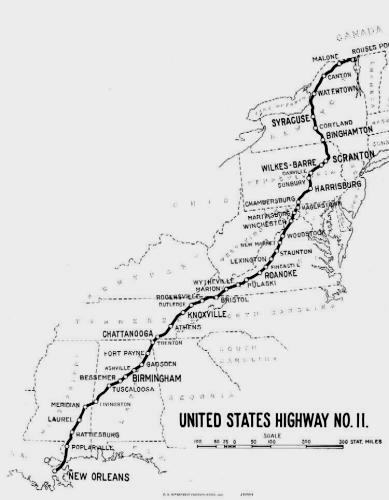 At one time, there were many of these paired routes in the US highway system, but most have been retired, replaced by other numbers, or at least shortened. They came about when state highway officials could not decide which of two routes was more primary and successfully lobbied for both routes to carry a US number. This pair of roads in Tennessee makes an interesting sight-seeing loop of 228 miles through the foothills of the Smoky Mountains. Let’s take a quick tour of this loop, starting in Knoxville. Knoxville has a zoo that has been completely rebuilt since 1962, when it was experiencing a decline. A small zoo based on what was known as the Birthday Park was opened in 1935, with some funds from the City, the Works Progress Administration, and the Tennessee Valley Authority. It closed in 1946 after suffering from lack of operating funds. Just two years later, citizens decided to try again and the City put up funding in 1951, relaunching the renamed Municipal Zoo. The first attraction was an alligator named Al, the former pet of local family who had acquired the reptile on a Florida vacation. The zoo continued as a small attraction through the 1960s, acquiring an African elephant named Old Diamond in 1963 from the Ringling Brothers Barnum & Bailey Circus. Though Old Diamond was popular and raised interest in the zoo for a while, conditions deteriorated throughout the 1960s. The current Appalachian Zoological Society was founded in 1970, leading to the modern Knoxville Zoo in 1971. The zoo currently is home to about 800 animals. Another site we could have seen in 1962 is the Blount Mansion, home of William Blount, the only signer of the US Constitution living outside of the 13 original states. It has been open to the public since 1930, when it was saved from demolition for hotel parking by a group that purchased the property. The Blount Mansion Association, Inc. then raised additional funds to restore it, allowing the Blount Mansion to become the oldest museum in Knox County. Blount’s mansion served as the territorial capitol of the Territory of the United States South of the River Ohio as well as his family home. Construction began in 1792, before there was even a city at Knoxville. The mansion is outfitted with period furniture and other artifacts to tell the story of its times as an important government building in the growing frontier of the young United States. The McClung Museum of Natural History & Culture has a permanent exhibit on The Civil War in Knoxville: The Battle of Fort Sanders. The exhibit contains artifacts, photographs and much more on the city during the war, showing how the area suffered from divided loyalties. Many people of that time favored continued membership in the United States, while others favored succession and joining the new Confederate States. There was even a day in 1861 when simultaneous rallies supporting secession and the Union were held, just days after the surrender of Fort Sumter in Charleston. Tennessee Senator Andrew Johnson, who would later become President after Abraham Lincoln’s assassination, delivered a speech favoring the Union while a Confederate band marched nearby! As a result of the strength of the opposing views, Tennessee was the last state to leave the Union and join the Confederacy at the outbreak of the Civil War. The museum was formally dedicated in 1963, though most of the collection was formed during the 1930s by the Tennessee Valley Authority (TVA). The TVA was created in 1933 to provide power and river management to the Tennessee Valley and because of concern for the many archaeological resources to be flooded by the new reservoirs, the TVA, the University of Tennessee, the University of Alabama, and the US National Museum conducted archaeological investigations. Most of the collection of artifacts ended up at the University of Tennessee. In 1955, a bequest from Judge John and Mrs. Ellen McClung Green of Knoxville provided funds to build a museum. The museum building was completed in 1961, just in time for our visit. There are other historical sites focused on the Confederacy in Knoxville and on its earlier history, including the Museum of East Tennessee History, the Bleak House, also known as Confederate Memorial Hall, and Crescent Bend, an 18th century house and gardens. But in this short review, it’s time for us to head out of town on US-11E. Morristown, Tennessee is the site of the Crockett Tavern Museum, which opened in 1958. It is a reconstruction of the type of building that would have housed the 1790s John Crockett Tavern, built on the site of the boyhood home of Davy Crockett. The project was an outgrowth of the 1955 Morristown City Centennial, which included an appearance at the local Princess Theater by Fess Parker, during the run of his movie "Davy Crockett, King of the Wild Frontier". The small museum displays artifacts typically found in homesteads and taverns of the period, including a replica of Davy Crockett's first gun. Growing up at the tavern, Davy's duties included hunting game for the supper table and taking care of the livestock of the cattle drovers and sheep herders who stayed there. Greenville, Tennessee was the capital of the state of Franklin, a short-lived state organized in 1784 out of three North Carolina counties. Tennessee became the 16th state of the United States on June 1, 1796. The city is the home of the Andrew Johnson National Historic Site and National Cemetery because President Johnson lived here both before and after his presidency. The site is spread across the village and includes Johnson's early home, a visitor center that includes his tailor shop and a museum, and the Andrew Johnson National Cemetery. The Historic Site interprets the life and legacy of Andrew Johnson's presidency, including his attempts to reunify a nation torn by civil war. Johnson was the first president of the United States who had been neither a lawyer nor a war hero. During his political career he served in nearly every office available to him, from alderman of Greeneville to President of the United States of America. He never attended a formal school, but acquired much practical knowledge. As President, he served from 1865 to 1868, surviving impeachment. The cemetery where Johnson, his wife, and children are buried, remained owned by the family until 1906. It came under the jurisdiction of the War Department until 1942, when it was transferred to the National Park Service. During its years under the War Department, veterans were buried there, a practice which continues to this day. 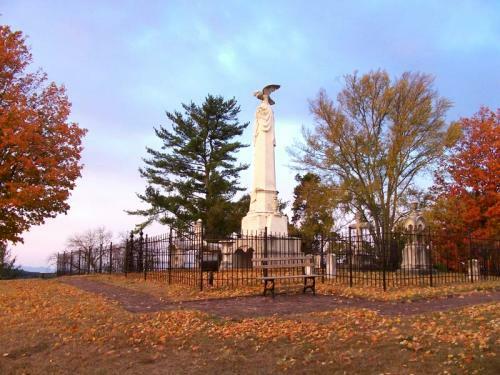 The Andrew Johnson National Cemetery is one of only two active national cemeteries within the National Park Service. Three historic markers at the Tipton-Haynes State Historic Site, Johnson City, Tennessee. At Johnson City, Tennessee, we cross our US-23 roadtrip. Johnson City is home to the Tipton-Haynes State Historic Site, a complex of eleven historic buildings. Also on the site are the Tipton/Gifford/Simerly cemetery, a limestone cave, a natural spring, and a short nature trail. The visitor center contains a permanent exhibit, where part of the site’s collection of over 1,000 artifacts representing history from the late 1700s through the early 1900s are displayed. The site tells the story of the history of Northeast Tennessee and of the several families that lived there beginning in 1784. Though you may think of the Revolutionary Period as concerning only the original 13 colonies, this part of the country was being actively settled at that time also. This area was originally part of North Carolina but by 1785, several counties had organized into a State of Franklin. It existed for three years with no major conflicts with the North Carolina loyalists. However, tensions developed into open conflict in February of 1788. A sheriff seized some slaves and other property of the Governor of Franklin, under orders of Colonel John Tipton, and brought them to Tipton’s home here. This action led to the Battle of the State of Franklin. The site became a State Historic Site some time after 1945, when a member of the Haynes family sold the farm to the Tennessee Historical Commission. Bristol is a very unusual city, having been originally founded to straddle the Tennessee-Virginia state line! The city is actually two separate cities, one in each state, but they are always combined for advertising and statistical purposes. In 1962, we could have visited a fairly new Bristol International Raceway, now known as Bristol Motor Speedway. It opened in 1961 and was almost built in Piney Flats, Tennessee, about seven miles south of the current location. That town didn’t want a racetrack, so the very first NASCAR race at Bristol was held on July 30, 1961. The track is short, only a half-mile oval, but it’s among the most popular tracks on the NASCAR schedule because of its distinct features. These premium features are the extraordinarily steep banking, an all concrete surface, two pit roads, and stadium-like seating. The steep banking was created during a 1969 redesign of the track. This is truly the place to watch great racers: of the 42 drivers in that first 1961 lineup, 11 were on the list when NASCAR named its 50 greatest drivers in 1998. If you stay in Bristol into the evening, you could check out whatever is playing at the Paramount Center for the Arts. 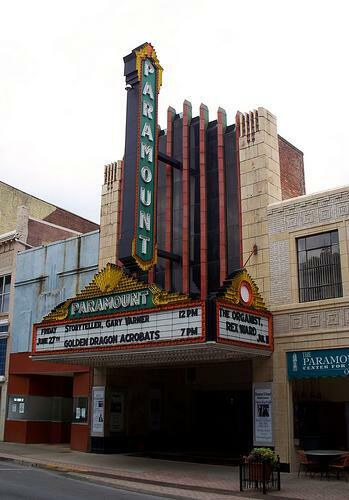 The Paramount is part of a chain of theaters built in the period of 1925-1935 by the Paramount-Publix Corporation, formed by the merger of several movie companies. The company had originally planned to build one "perfect movie house" in every state of the union, but only a few were completed before the Great Depression ended this plan. We saw the Paramounts in Peekskill, New York on our US-6 trip, and Ashland, Kentucky on our US-23 trip. Additionally, at the end of our US-6 trip in Hollywood, California, we saw the El Capitan, which was formerly one of the Paramount chain. The theater here in Bristol was constructed in 1930-31, in a style that has been described as a combination of art deco and Italian Renaissance. As is typical of these large, ornate movie houses, the last movie was shown in 1979 and the building sat essentially empty for the next ten years. The owner donated the theater to a community organization in 1982 and it was placed on the National Register of Historic Places in 1985. The community began planning how to renovate and re-open it. Over a million dollars was raised locally and the State of Tennessee matched the amount, allowing restoration and eventual re-opening in April of 1991. The marquee is a replica of the original, as the original was deteriorated beyond repair. The chandeliers in the lobby are the original fixtures, with the exception of the bottom plate, and are of either Tiffany or Lalique glass. Ceiling patterns and murals were redone using hand drawn stencils traced over the original decorations. The concession stand dates from the 1930s, when only candy was sold. It was not until 1947 that popcorn and soft drinks were introduced! The original theater organ was dismantled in the 1950s, when the building was remodeled for stereo sound and Cinemascope projection, with the pipes going to an amusement park in Alabama. We would have seen it without an organ in 1962. But the current Wurlitzer organ was moved here from another Paramount Theatre in Charlottesville, Virginia! The original bathrooms were extravagant, with the men’s room decorated like a hunting lodge and the women’s interior covered in Carrara glass. These were not restored to their previous elegance. Today, the Center is operated by a local non-profit corporation. You can see showings of popular movies, such as "It's a Wonderful Life" during the Christmas season, or showings of PBS Masterpiece Theater television dramas on the big screen. They also offer live stand-up comedy by nationally-known acts, or musical acts ranging from country by Wynonna to rock by a Led Zeppelin tribute group. Local events are also held here. Before you leave Bristol, another stop you could make either in 1962 or today is at Bristol Caverns, which has been open since at least the 1940s. Tours go to all three levels of the caverns, so they include some rather steep stairs. But it has a great Underground River, which is a feature I always enjoy in a cave. At Bristol, we turn around and head back southwest on US-11W, the other half of the US-11 split route. We soon arrive in Kingsport, Tennessee, which we discussed on Day 12 of our US-23 roadtrip. After that, it’s about a 92-mile drive back to Knoxville. I hope you had a nice trip driving the Tennessee loop of US-11 and I’ll see you soon back in 1962 at Roadtrip-'62 ™.